In addition to providing a robust viewing experience for hand-held and wearable devices, display technologies also offer touch capability for devices, giving consumers limitless ways to control their devices. Touch capability in various modes, such as using a stylus or fingers on devices, causes multi-point compression across a display panel. Force applied from touch varies by individual user and across device types, such as infotainment systems in automobiles, smartphones, tablets, touch-enabled laptops, etc. On average, billions of touch points are engaged by the user on a display panel of a typical hand-held device. With OLEDs as the next generation display technology, it is critical to perform multi-point compression testing to understand the effect of force applied on the multi-layered organic thin films at various locations of the display panel. 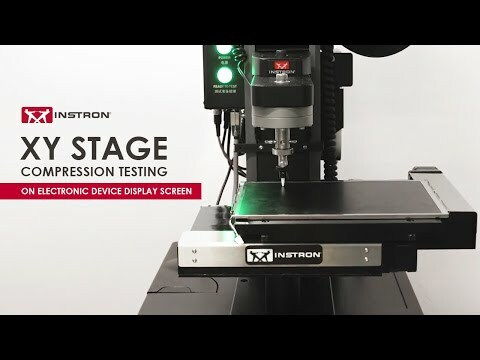 Instron’s 5900 series single column systems are suitable for performing multi-point compression tests on screens and displays. The XY stage on a single column system offers the ability to automate multi-point compression testing on different sized display panels. Probes of different designs and materials (steel, plastic, etc.) are available to perform this compression testing. The Bluehill® software multi-test feature, enables the user to easily set up methods for automating compression testing at various locations, such as 9-point compression testing, and record results at various points. Critical results, such as deflection at a certain load, can be computed using the software.